I should have saved some of my De Pelikaan Geurthee no 5 to prepare in the Kikkerland Ora Teapot! What's the connection? Kikkerland hosted the US launch of De Pelikaan teas on May 7. The tea that christened my Ora Teapot was Summertime Chai by Piper & Leaf based in Alabama. I steeped the loose leaves with hot water and served the hot tea from my Ora Teapot. You don't need to steep the tea in a separate pot either. The teapot has a wire infuser to prevent leaves from pouring into your cup. The double-walled design of the teapot and the tea cups kept our hands body temperature and the tea at sipping temperature. Th tea set works well with chilled beverages, too. Actually, the Ora teapot and cups are great transitional tea-ware from summer to fall. I really like using this tea set! 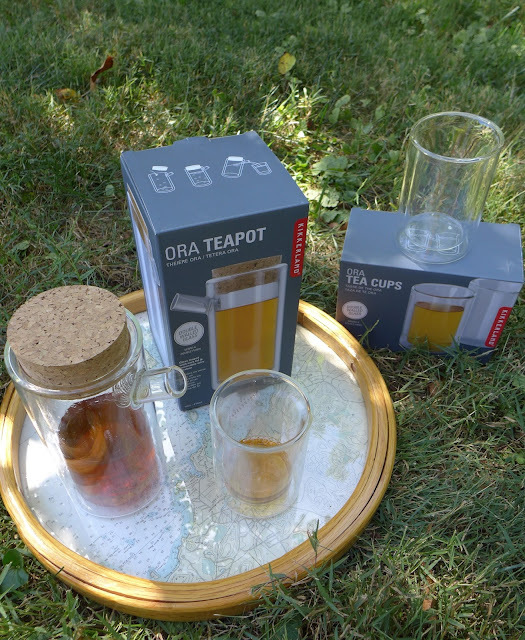 Thanks to Kikkerland, a Notes on Tea reader will win an Ora Teapot and a set of Ora Tea Cups. Enter below. Best of luck! This giveaway is open to residents of the continental US. It ends on September 21, 2015 at 12:00 am EST. After being contacted, the winner has 48 hours to respond, otherwise a new winner will be chosen. P.S. For the remaining Summertime Chai, I cooled the liquor slightly, flash chilled it in the freezer, then transferred it to the refrigerator. The Summertime Chai served very cold the next day was very fine! Stay tuned for a review. Hot or cold, oooh tough one, that is a lovely pot and it would be great for cold brewing and gorgeous when I am showing off tea at an event. So it is a tie! Either way; I just love the tea pot! I tend to prefer hot tea, but I just recently got some Moroccan Mint tea that I've been wanting to make iced for the end of summer and it would look so beautiful in this tea set! I LOVE Kikkerland's stuff. I think I'd use it to make hot tea, but from the looks of it, I could use this as a cold brew device for loose leaf tea too and I really like that idea. But I think since I'm primarily a hot tea drinker, I'd use it to brew hot tea. I won :) Thank You!